35" 35" 39" 39" 46" 50" 53" 53" 36"
The most powerful wire ever! Highest spark energy transfer. Highest EMI/RFI suppression. Highest horsepower gain. 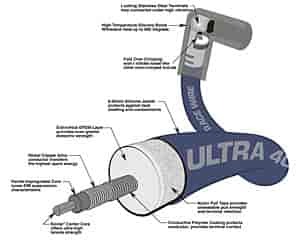 The Ultra 40 Race Spark Plug Wire's extra insulation extends spark plug wire life against exhaust header heat, chaffing and contaminants. Closely woven fiberglass, impregnated with high-voltage-leak resistant silicone adds up to 8,000 volts of extra insulation. At 40 ohms of resistance per foot, Moroso Ultra 40 Race Spark Plug Wire incorporates a spiral wound nickel/copper alloy conductor wrapped at the optimum ratio to produce the highest level of spark energy while producing the lowest level of electromagnetic and radio frequency interference. The Kevlar core is four times stronger than other aramid fibers cores, allowing an increase in the tensile strength of the wire while reducing the center diameter and at the same time increasing the surrounding insulation resulting in greater dielectric strength. Note: Straight plug boot kits are bendable to 45 Degrees.